I didn’t exactly plan things this way, but for some reason the last year has seen me playing quite a few Koei Tecmo games. Nioh, Blue Reflection, Nights of Azure, Fatal Frame III, even Metroid: Other M by a technicality. I also have Warriors All-Stars sitting on the very short list of “up-next” games. I’d never really paid attention to them outside of the Dead or Alive and Fatal Frame series, so I was kind of surprised to realize how much variety exists in the games they publish. 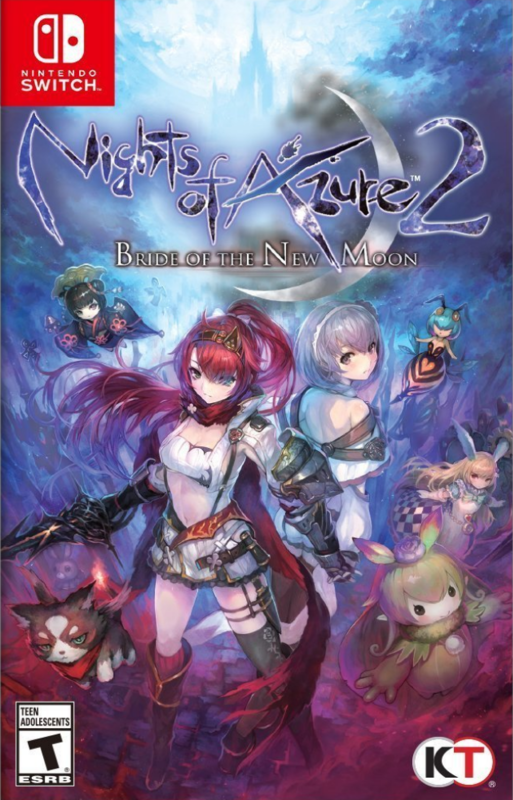 So, let’s have an awkward segue here and talk about Nights of Azure 2: Bride of the New Moon – or, rather, the original game because it’s hard to talk about a sequel without its predecessor. I played Nights of Azure in November and thought it was an awfully pretty game with some amazing costume design, a combat system that felt a little too floaty to be satisfying, and way too many different systems to keep track in what was, after all, a fairly short action RPG. I also got a little tired of my best friend constantly running off to try to sacrifice herself to the Nightlord. Some great news, then, in that a lot of the “why is there a ship trading simulator in my action RPG again?” systems were dropped for the sequel, your best friend doesn’t dwell TOO much on running off to sacrifice herself to the Moon Queen, and combat is greatly improved. The first game had you running around with up to four little demon familiar pals at any given time, and some of the fights had me feeling like my best option was to stay out of the way and let my pets do a lot of the work. Not so in the sequel – while you do still have a couple of pets, they don’t feel quite so center-stage. The most important criteria in pet selection is that there are a few kinds of gates that close off optional areas with treasure chests, and each of these kinds of gates can only be opened by a certain pet. In fact, combat in general has a feel to it that is greatly improved. It’s always difficult to define “weight”, but NoA2 felt “weightier”. It’s still a button-masher, though, make no mistake. Some of your demon pals can transform into different weapons for you to use, at least, each with its own moveset, so there’s more variety in your mashing. I didn’t play around with the alternate weapons too much, however, since I always wanted to have a couple of door-opening pets handy. Oh, right, you also have a human/demihuman partner, or rather your choice of several different partners, and you get to do all sorts of pair attacks based on your buddy. As you spend more time with a given partner, you’ll unlock story events with them, and all of the characters turn out to have some pretty interesting backstory. To be honest, the whole “saving the world from eternal night” kind of faded into the background and I found myself a lot more invested in learning more about the different characters. Soooo, that leaves the bad parts of the game to talk about, and unfortunately there are quite a few. If you played the first Nights of Azure and grew to know your way around its fairly large and interconnected maps, the biggest shock is likely going to be the drastic reduction in environmental variety. The sequel has a total of seven areas (and a DLC area), and quests will have you revisiting each area over and over again until you are foaming at the mouth the next time you get sent to clear out the monsters in the Spirit Forest AGAIN. The maps are also made up of very small segments, and it just feels like it was designed around devices with intense memory constraints. That same feeling of being designed for last-generation devices extends to the monster variety, or lack thereof. With the exception of a few bosses, you’ll see the same handful of creature designs in every zone – there’s no sense of place to them. Finally, I really should not have bought the Switch version, because it’s a mess. I talked myself into it because it had a downloadable Fatal Frame outfit and I thought that it’d be, you know, maybe a little bit of a downgrade but what the heck, right? If you’re playing on the built-in Switch display, it’s… passable. I actually wound up using the Switch in desktop mode for about two-thirds of my play sessions, and it’s much easier to overlook the criminally-low-resolution textures when you’re looking at a screen that size. Blow it up to the 43″ set I use for most of my gaming, though, and it looks like something from the lower end of the PS3 library – and that may be stretching things. Looking at the download size of the Switch version – 6.8 GB – compared to the 20GB PS4 version says a great deal about what happened here. I suspect they squeezed the heck out of everything so they’d be able to ship it on an 8GB cartridge, and it absolutely shows. I mean, you’ve got a mostly-fully-voiced game with a fair bit of dialog, some FMV cutscenes, and of course a typically-great Gust soundtrack… something had to go somewhere. So, I guess what I’m leading up to is that my IDEAL Nights of Azure 3, should they eventually make one, would be the game systems of the second game combined with the world and visuals of the first game. And I’ll probably get the PS4 version next time.